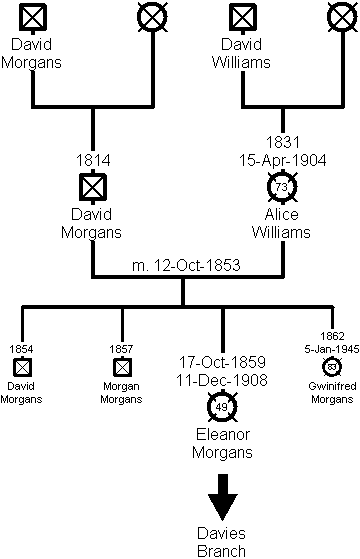 David Morgans was born circa 1814. He was the son of David Morgans, a labourer. He married Alice Williams, the daughter of David Williams, also a labourer, on 12 October 1853. Both David and Alice were servants in husbandry. David later became an agricultural labourer. After marrying they lived at Pwllswyddog, Caron-is-Clawdd, Tregaron, Cardiganshire. On 11 October 1859, Eleanor Morgans (their third child of four) was born. David died between 1871 and 1881. After David’s death, Alice lived with their youngest daughter, Gwinifred, at Prospect House, Tregaron. Alice died on 15 April 1904, aged 73. Eleanor Morgans was born on 11 October 1859 at Pwllswyddog, Caron-is-Clawdd, Tregaron, Cardiganshire. In 1881 Eleanor was working as a dairymaid and in 1891 she was working as domestic servant at the Lion Hotel in Tregaron. On 20 November 1895 she married a widower, Evan Davies. Although Evan was born in Llanddewi Brefi, he was living in Treharris, Glamorganshire. Eleanor moved to Treharris. Evan and Eleanor had four children. The oldest David Davies was born on 8 September 1896. Eleanor died on 11 December 1908.